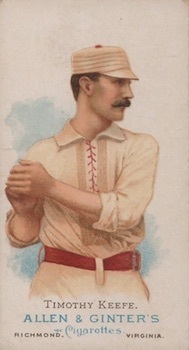 Allen & Ginter's best-known set was issued in 1887 under the "World's Champions" tagline and featured 50 athletes from several different sports. The fronts feature a brightly-colored lithograph painting that blends into the white border around it. 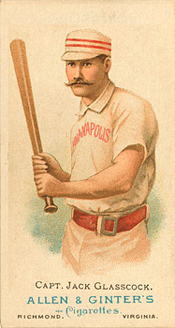 Some cards feature an added image related to the sport represented, but none of the baseball players have that. Below the picture are a name, an advertisement for Allen & Ginter and a note of the company's home city of Richmond, Virginia. The backs feature a checklist, with all 50 athletes listed with their respective sports. Only ten cards feature baseball players, and six of those are Hall of Famers. That makes the set attractive to collectors, but many don't consider picking up the non-baseball subjects as well. 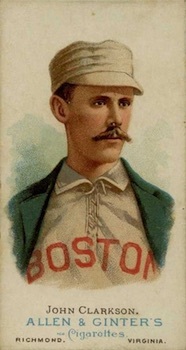 Those non-baseball cards do have some added value, since they sometimes feature personalities that are legendary in American history, such as sharpshooter Annie Oakley, showman Wild Bill Cody and boxer John L. Sullivan. The full set features baseball players, pugilists (we now call them boxers), wrestlers, oarsmen, rifle shooters, billiards and pool players. The company also offered the same 50 images found in the set as a premium album in exchange for coupons. 1887 N28 Allen & Ginter Adrian Anson HOF SHARP!! SGC 40 !!! 1887 N28 Allen & Ginter Buffalo Bill Cody SGC EX 5 No Creases! GORGEOUS! 1887 Allen & Ginter N28 Jack Dempsey HOF SGC!!! 1887 N28 Allen & Ginter Maurice Daly Billiard Players SGC 30 !! 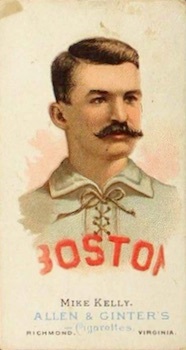 1887 N28 Allen & Ginter J.L. Malone Billiard Players SGC 20!! 50 cards. Shop for base cards on eBay. 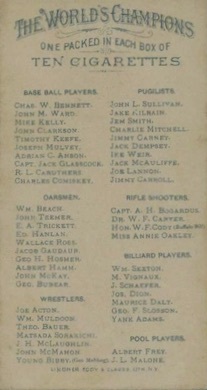 The cards are listed below in alphabetical order by last name and grouped by the specific sport. 1887 N28 Allen & Ginter DR. W.F. Carver Rifle Shooter PSA 4.5 !! 1887 N28 Allen & Ginter John Teemer Oarsman PSA 4 !! 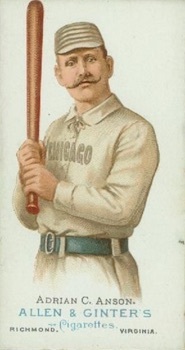 1887 N28 Allen & Ginter Geo. Bubear Oarsman PSA 4.5 !! 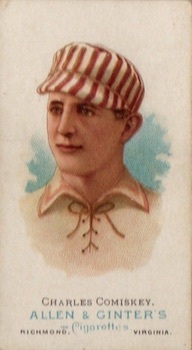 1887 N28 Allen & Ginter E.A. Trickett Oarsman PSA 5 !! My pick for the best looking tobacco era trading card set of all-time. Content wise it has a little bit for everyone, and its almost all good. And thanks to Topps breathing life back into the brand, a whole new generation of collectors now know about and appreciate this iconic set. While they don’t have the appeal of the baseball cards in this set the other cards are definitely interesting and are relatively affordable for 100+ year old cards.